Oral hygiene is important for everyone, even when you wear braces. However, for those with braces, it may be a different experience when flossing. Flossing with braces isn’t hard, though. With the right techniques and help from the orthodontist Vancouver residents see for their smiles and braces care, you can preserve your oral health. Flossing and brushing is especially important when you wear braces so let’s take a look at how you can be sure tooth decay and cavities don’t ruin your smile. Our Vancouver orthodontist hears this question a lot. It can be challenging getting use to flossing with braces. With a few changes and care, however, it’s easy and guarantees your oral health remains in top shape. Use a floss threader or dental flossers to gently floss between each tooth. Take care to not damage your wires and brackets. A great way to floss when you wear braces is with a water flosser. These use water and pressure to clean between the teeth. Water flossers benefit oral health by keeping gums healthy and teeth free of bacteria and plaque. They are gentle on braces and your smile and have long lasting benefits. Consult with our Vancouver orthodontist team to determine what style is best for you. When you have braces, a good oral hygiene routine is the key to your smile. Keeping your oral health in top shape will ensure, once your braces are removed that your smile is healthy. Brushing twice a day and finding a solution to flossing with braces will keep cavities at bay. 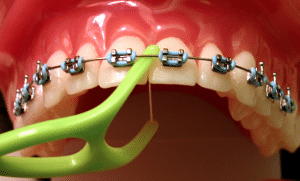 If you wear braces, or will soon be getting braces, make sure you talk with us about flossing. We’ll make sure you are equipped with the tools you need for a healthy smile. You can learn more about hygiene tips and braces on our Facebook page or by giving us a call. We’re here to help you maximize your smile potential.